In Art Style: Rotozoa, control a circular creature-like organism known as a rotozoan and nimbly make your way through level after level of primordial ooze. Comprised of only three distinct parts (colored sides, tentacles and life force), the focus of your rotozoan life is simple: grow your tentacles. After playing a few levels and learning the basics of your microscopic world, you begin to unlock additional modes of play and the ability to choose the number of tentacles on your rotozoan. Each mode has its own specific purpose: reach a particular length with your tentacles or grow them to the greatest length possible. In either mode, growing your tentacles means absorbing enemies known as goobugs by touching them. There's just one catch: Successfully absorbing a goobug depends on matching its color to your tentacle. Also, longer tentacles can more easily come in contact with incorrectly colored goobugs (causing damage to the tentacle and decreasing your life force), and the goobugs themselves multiply and begin adapting to your movement. Luckily, objects such as the restorative heart item and special attack-enabling cyclone item can be found floating in the ooze to help your rotozoan survive. With atmospheres ranging from peaceful to intensely challenging, Art Style: Rotozoa offers a wide variety of levels. Victory can only be achieved through quick, precise movement and the ability to remain calm under pressure. Are you ready to take on the goobugs? Games in the Art Style series feature elegant design, polished graphics and pick-up-and-play controls, creating an experience focused purely on fun and engaging game play. 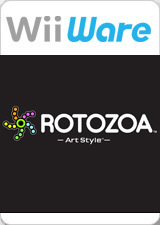 The graph below charts the compatibility with Art Style: Rotozoa since Dolphin's 2.0 release, listing revisions only where a compatibility change occurred. This page was last edited on 8 January 2018, at 09:35.